After baking for years I have discovered my own personal preferences; mostly, I like to bake things that are quick, delicious and individual-sized such as cookies, scones & tartlets. Pastries I save for whenever I'm in Paris. Cupcakes whenever I've got time and patience of my hands. And cakes whenever a birthday comes. My birthday isn't until november but I felt like making a beautiful layer cake that was easy to decorate. I quickly turned to one of my all-time favorite cakes: a Boston cream pie. I lost count of how many Boston cream pies I have baked over the years. I do remember that it was one of the first things I ever baked. Like then, this cake still mesmerizes me. The soft, airy cake with a luscious vanilla pastry cream, topped off with a thick chocolate ganache wins me over every single time and this particular recipe has been the best one yet! Rating: 5 out of 5. - Fill cake: For easy cleanup, place a piece of waxed paper under rack. With a serrated knife, split cooled cake horizontally (leave bottom half on rack). Spread bottom half with Vanilla Pudding to within ½ inch of edge; gently place top half of cake on pudding layer. - Make Chocolate Glaze: In a small saucepan, bring heavy cream to a boil. Remove from heat, and add chocolate; stir until smooth. - Set aside to cool to room temperature and to thicken slightly, about 10 minutes. When glaze has thickened, pour over filled cake. Using a small metal spatula, spread glaze to edges of cake, allowing it to drip down sides. Let glaze set, 15 to 20 minutes. Leftover cake can be refrigerated, loosely covered, up to 2 days. - Place a fine-mesh sieve over a medium bowl; set aside. In a medium saucepan, off heat, whisk together sugar, cornstarch, and salt. If making chocolate pudding, add cocoa powder. Very gradually (a few tablespoons at a time) whisk in milk, taking care to dissolve cornstarch. Whisk in egg yolks. - Place plastic wrap directly on surface of pudding (to prevent skin from forming); chill at least 3 hours and up to 3 days. Before serving, whisk pastry cream until smooth. impressive and it made me feel like I want a cake NOW. Looks devine....I must make this! 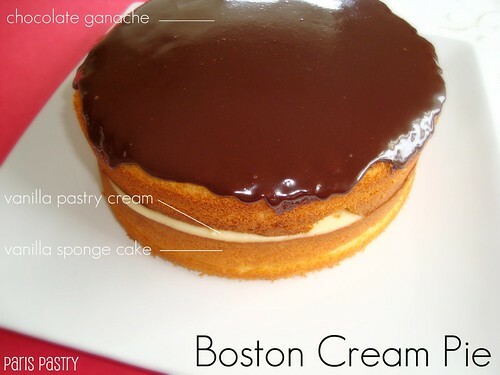 Oh, Boston Cream Pie! It's been so long since I've had a slice and this makes me want to have one right now! I'll have to try your recipe ... feeling the craving very strongly! Anything with custard and chocolate is a winner in my book! I'd even settle for a creme filled eclair right at the moment. The picture just looks so good! 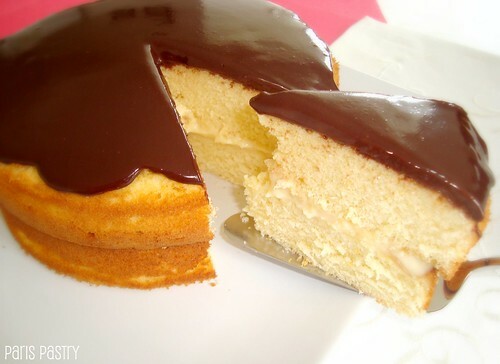 This Boston Cream Pie looks absolutely perfect. Wish I had a big slice of my own right now. OMG! I just got home from work but I want to make this NOW!! !